Attention Perps! In just over one month Judge Dredd: The Cursed Earthwill be available, giving you the chance to lead a team of Judges through a post-apocalyptic wasteland. Based on Peer Sylvester's best-selling The Lost Expedition, the game offers solo, co-operative, and competitive experiences, and features brand new illustrations from Dredd artists Rufus Dayglo and Dan Cornwell. 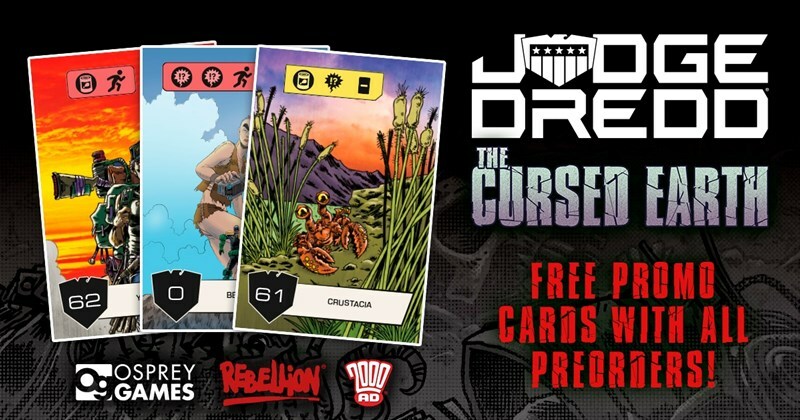 Just in case the Cursed Earth wasn't dangerous enough, we'll be sending a set of promo cards alongside every preorder of the game from the Osprey Games webstore, adding new challenges for you to face as you track down your target. To be eligible you must preorder the game before 21 Feb 2019 - for those of you who have already preordered we'll make sure you get a set too!